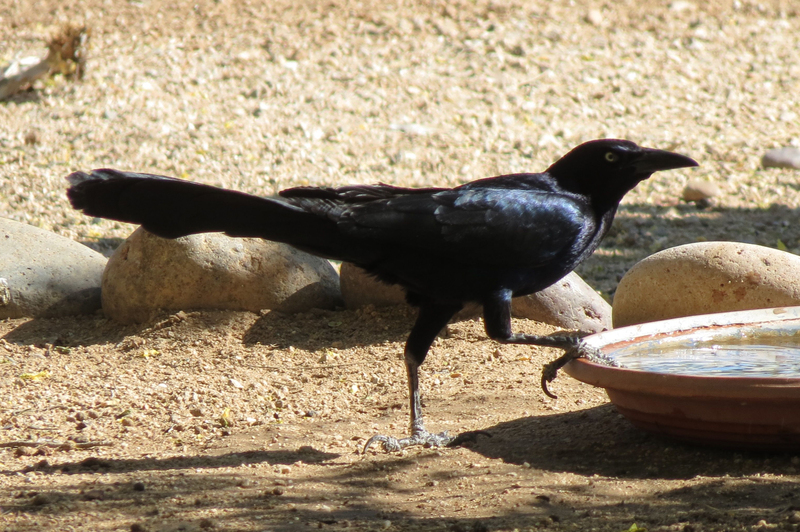 Let Me Tell You ‘Bout the Birds and the Bees and the Flowers and the Trees…. And the Clouds Up Above…. And a thing called Love…. I LOVE this Spring! 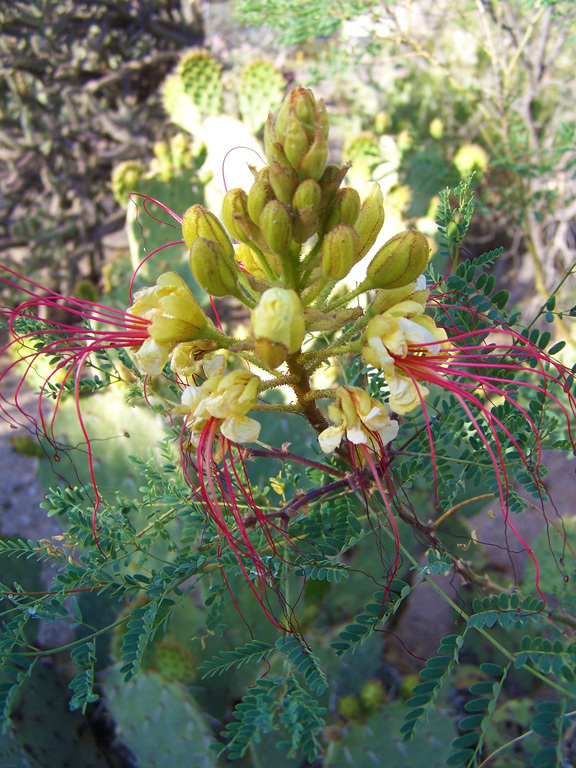 The desert is bursting with blossoms and buzzing with activity. The unusually wet weather has made this month aMAYzing!! It usually doesn’t get this lush and green until mid July! 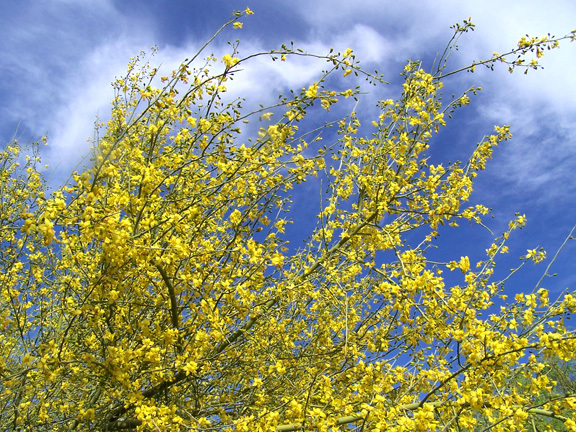 And the Palo Verde Trees were spectacular with their brilliant canopies of yellow! 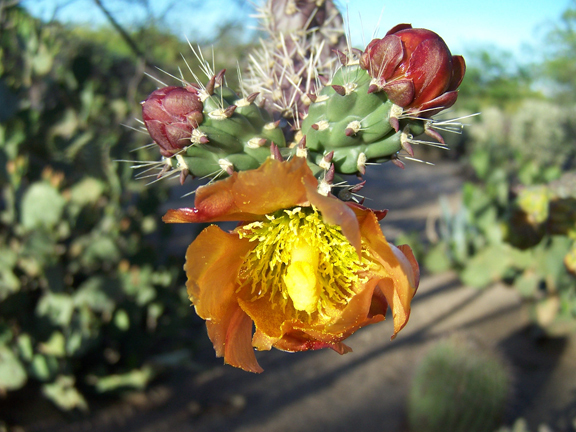 I just love the Palo Verde Trees! 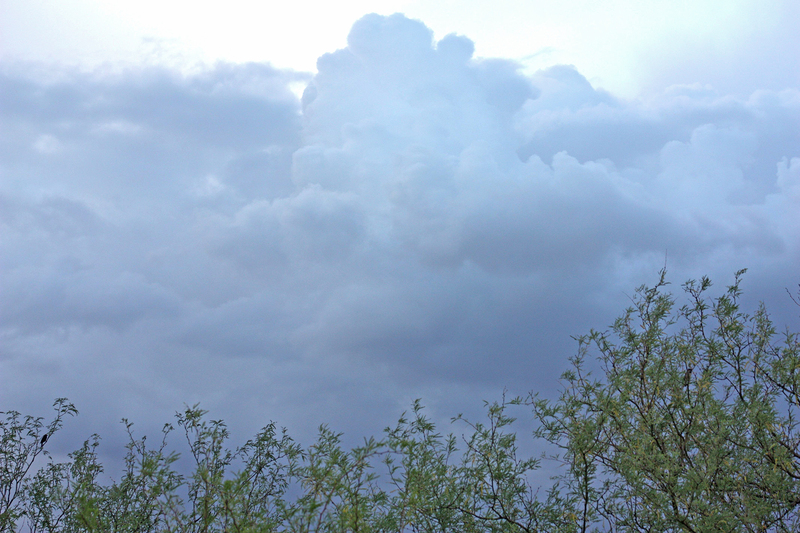 In fact, it’s been a monsoon-like this Spring…Just last week it built up in the afternoon. Big billowing clouds with distant rolls of thunder and a hint of rain wafting in the air. We love these kinds of days before the heat of summer has us in it’s grasp! Gotta Love it!! 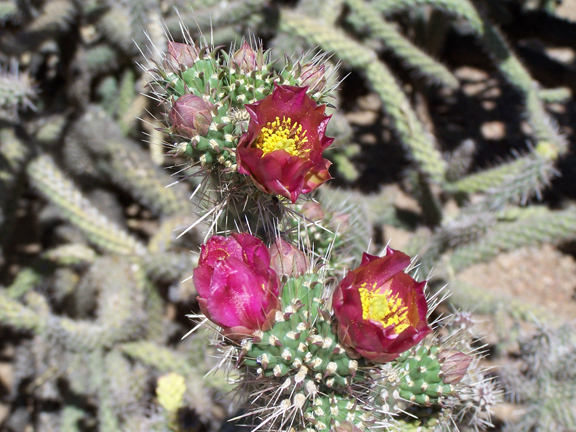 The Buckhorn Cholla. Love them prickles ‘n all! 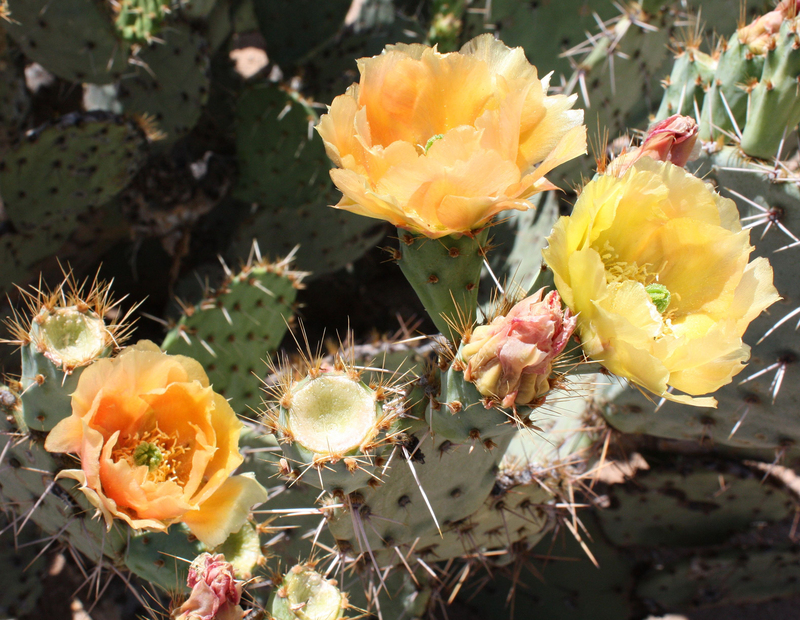 And the Prickly Pear popped with a variety of peaches and yellows…Love, Love Love! Some of the blossoms are bugged 🙂 Love…not so much! 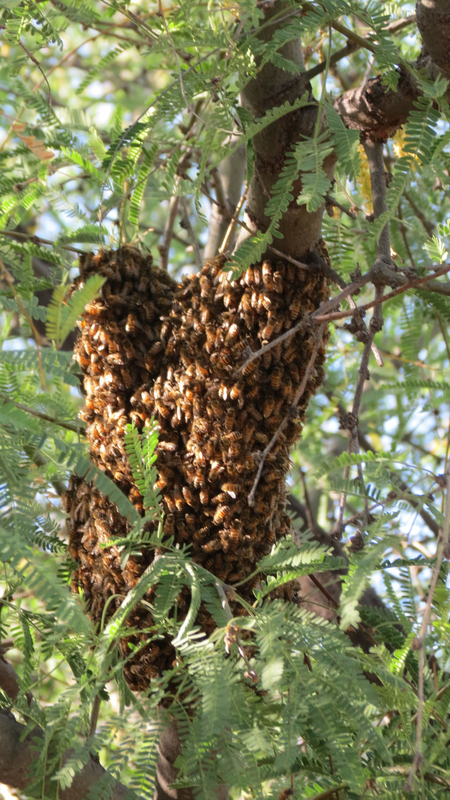 A few weeks ago, we were shocked to discover the mesquite tree that sits right off of our porch, had been bee-dazzled by a huge swarm! We have never seen anything like this. I didn’t even notice them until my brother-in-law pointed it out! The dogs and I had been walking around the tree and sitting right next to them for some time. These were, most likely, killer bees…or a killer bee hybrid which, I’ve been told most bees in this area, are now. I’ve also been told that they usually only get aggressive when they’re threatened by certain noises or smells. Luckily, we didn’t buzz them off!…We must smell and sound ok? They disappeared as suddenly as they appeared, when it warmed up in the morning…Whewwww! I’m pretty sure that the birds that frequent that particular tree were happy to see them go as well! I noticed while the bees were there, the birds, especially the humming birds were chased away by the buzzy bee guardians. But after their abrupt departure, the usuals came back to their favorite hangout…. 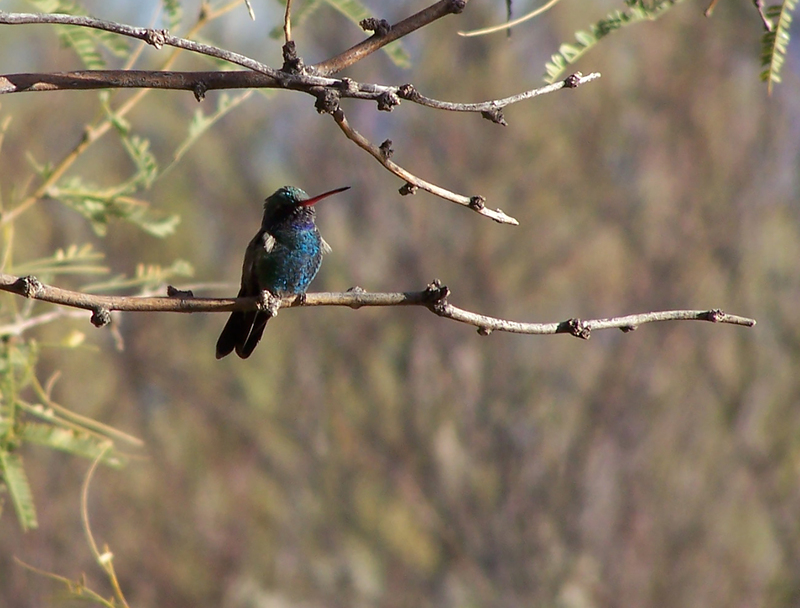 And the Humming Birds. Love them all! 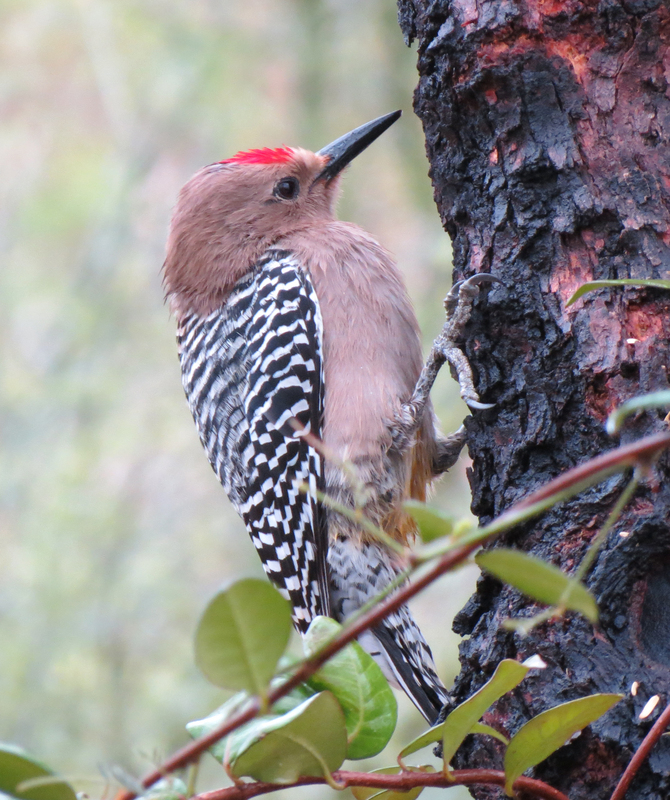 The dreaded Wood Pecker resumed his perch! Can’t say I love you dude! 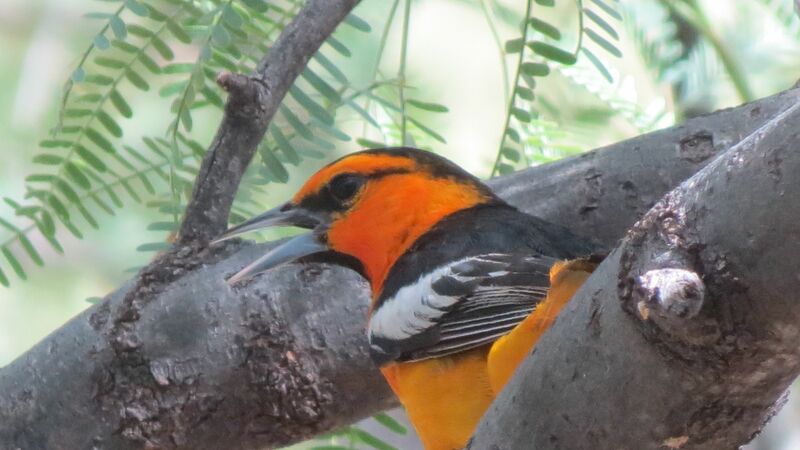 Of course we have a huge variety of other feathered residents, but they tend to frequent some of the other trees in the yard. 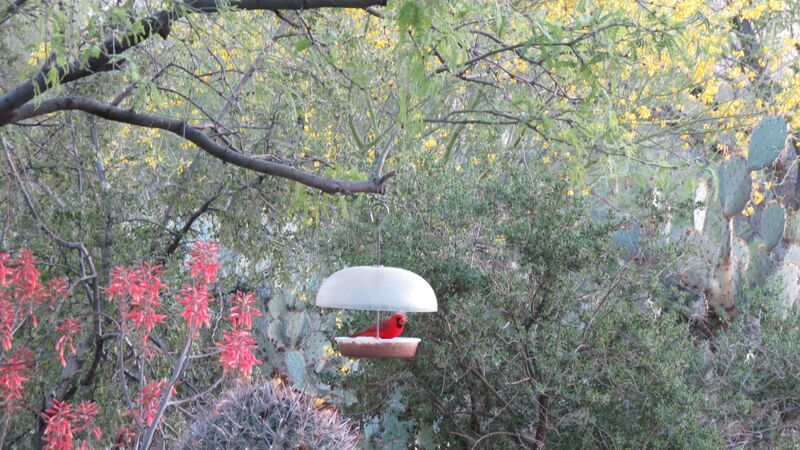 We did have a different feathered visitor which we had not seen before in Todd’s Backyard…. But evidently, he was not impressed with the accommodations and left…haven’t seen him again. Hey…you’re mission’ the love! Oh, well! 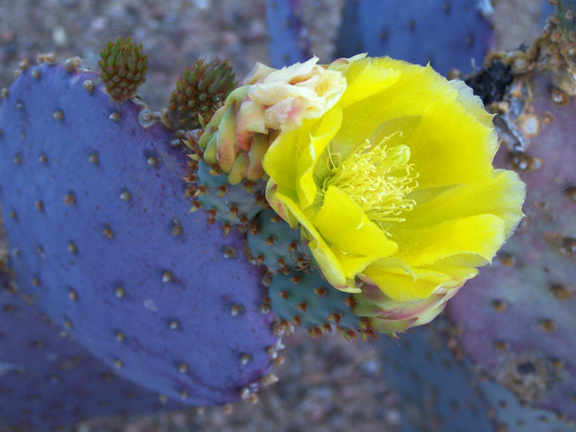 Prickly pear cactus are most commonly seen, yellow flowers on the purple and red flowers on green. 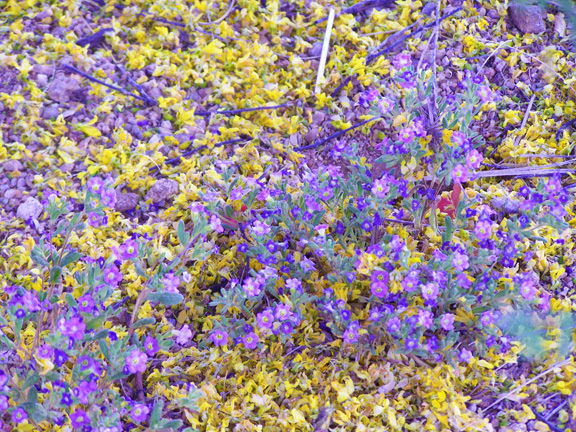 Perfectly contrasting colors on a color wheel, and when it happens in nature it’s truly ideal! 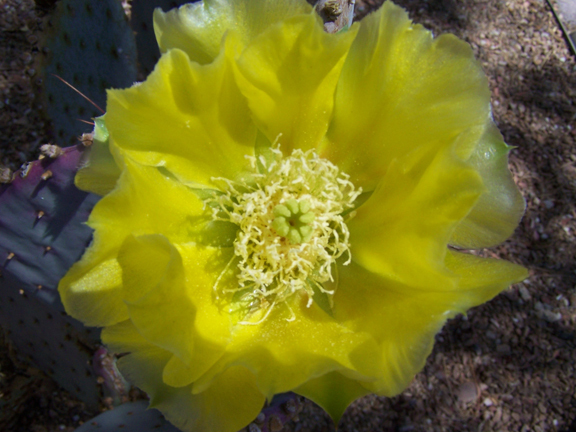 For instance, our Argentine Giant, we call the Jacktus, has the largest blossoms of all the cactus! Sometimes 8 inch blossoms dwarf it’s appendage, making it look like some strange awkward assemblage! 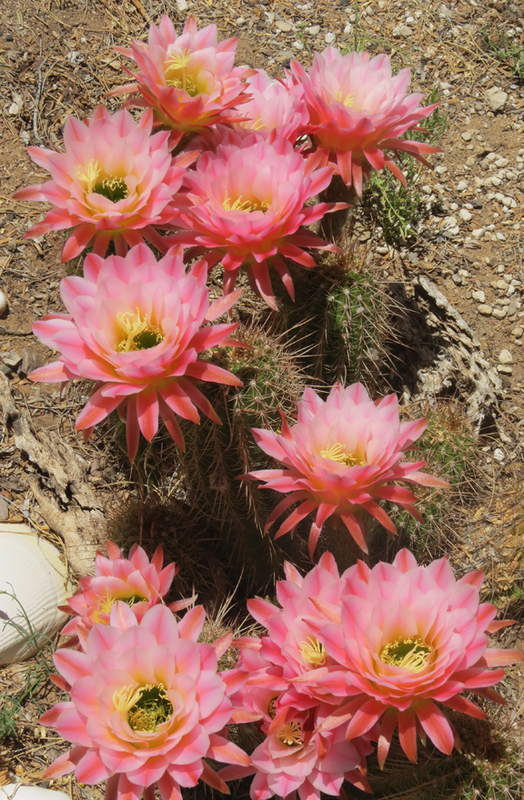 These pretty pricklies are a variety of Echinopsis. 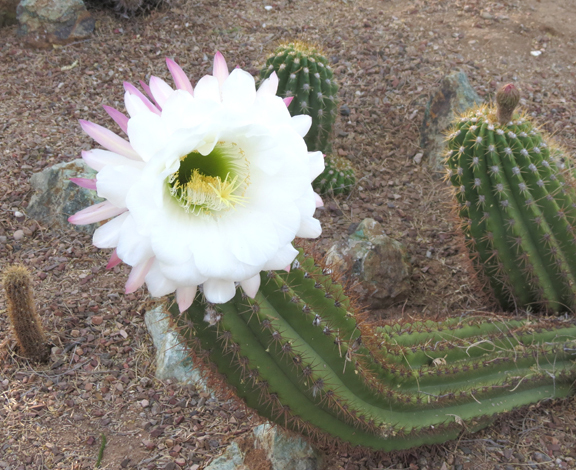 They grow into a beautiful blossoming cacti colossis! Perfect for a cactus garden..”EXCUSE ME, WHAT?! 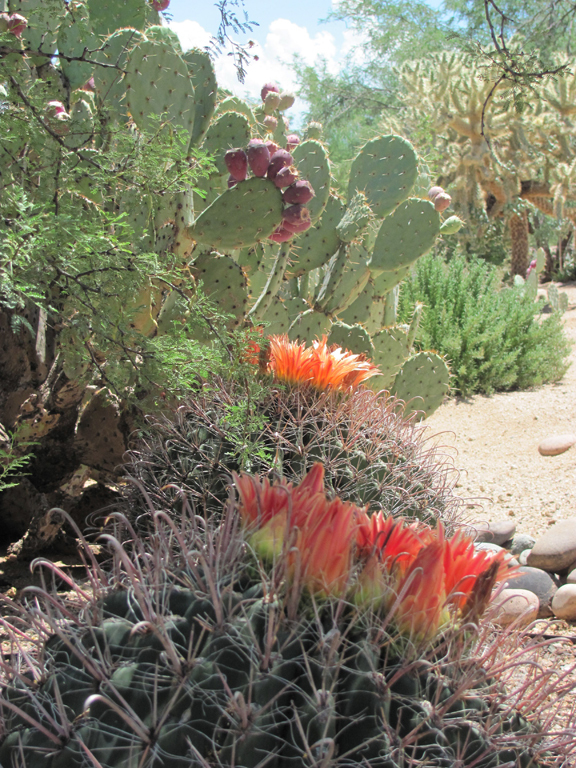 !” …a cactus garden? “I beg, your pardon’. 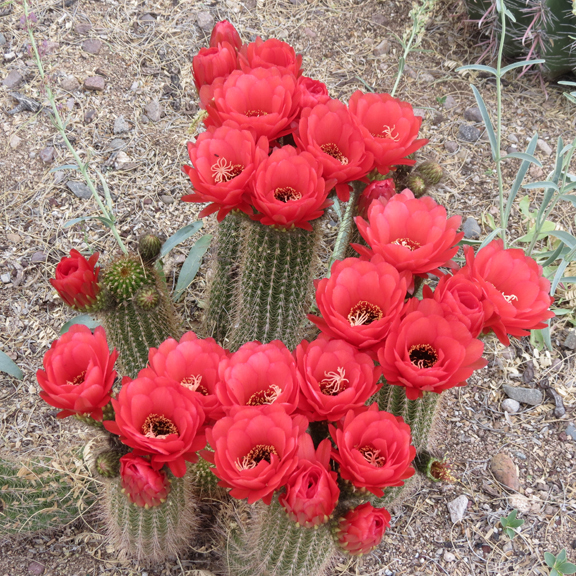 Varieties have names like ‘Red Torch‘ and ‘First Light’, the Echinopsis cactus are a desert garden delight! The blossoming, pollen packed trees have dropped their adornment, and are now lush, green and shady. The temperatures are gradually easing us into the blasting heat of Summer. The nests are full of baby birds, chirping for their mothers. 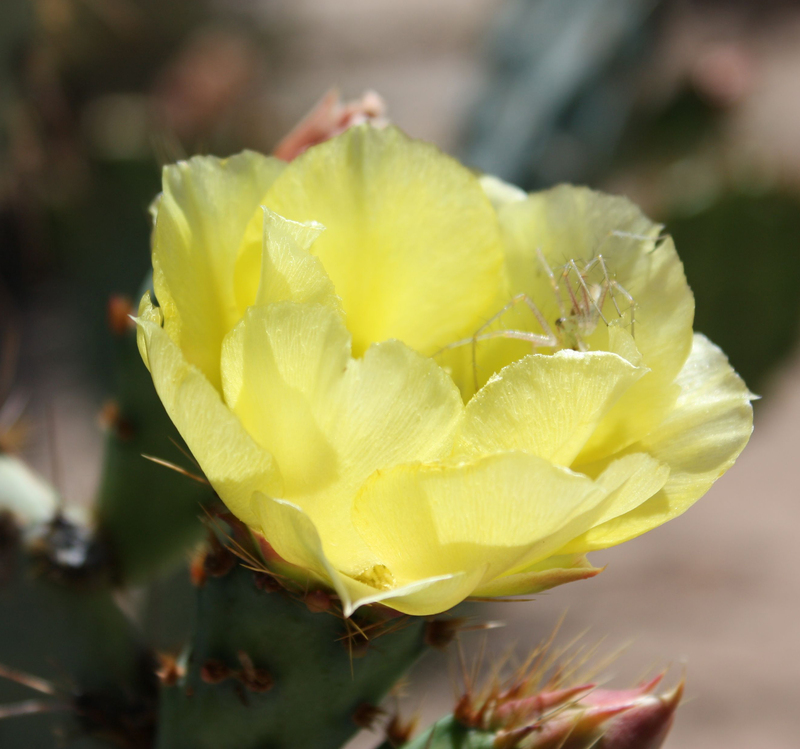 And it is in May that the cactus are in full bloom, providing the perfect subjects for awesome photos! 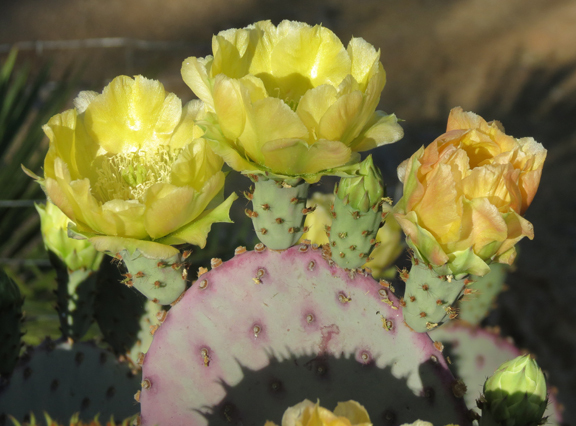 We can never get enough photos of the cactus blossoms! Thank you Mother Nature! May I wish my mother and Todd’s mother (and mother’s of all species), a beautiful and blossoming Mother’s Day! Spring has sprung! 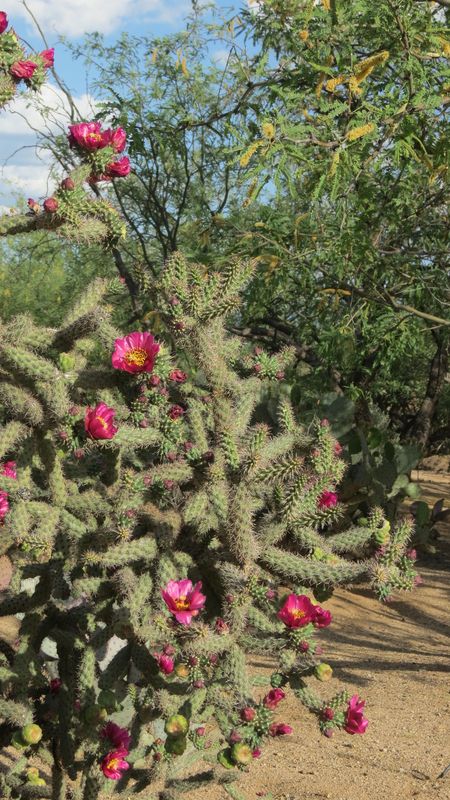 And it has brought with it all of the wonderous desert, springy thingies, such as snakes and lizards emerging from their winter lodging, crazed rabbits zipping around the yard and shrieking birds feeding their babies. There is, in general, an overall hustle and bustle in Todd’s Backyard that we see only in the Spring. 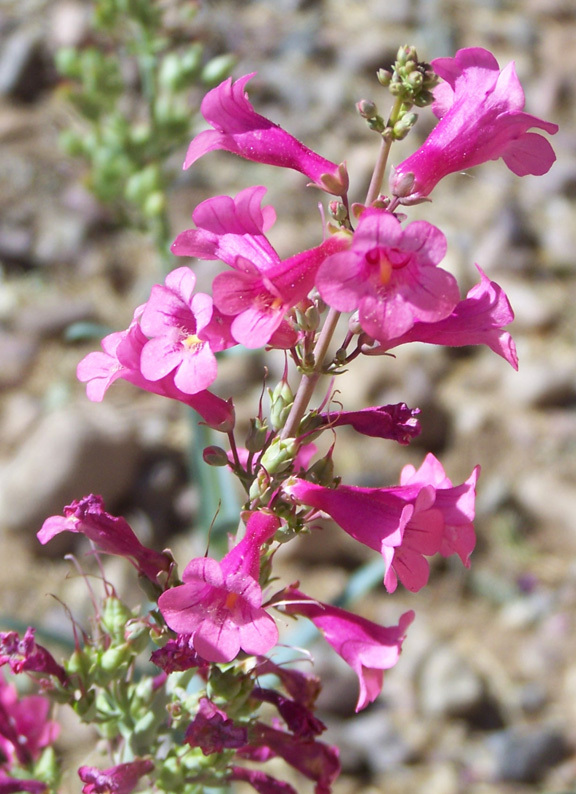 But the event that we look forward to the most this time of year, is the transformation of the usually drab desert, into an awesome spectacle of color and fragrance! 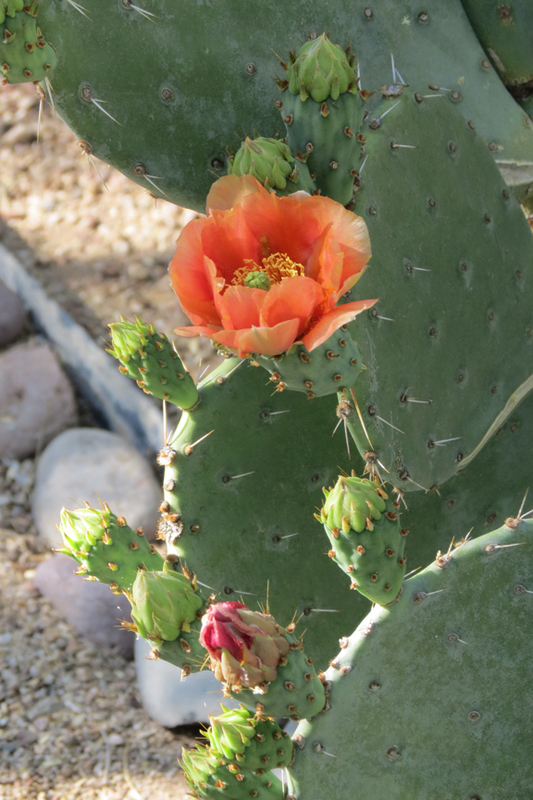 This beauty is actually in our neighbor’s backyard, where they have a fence to keep the javelina from feasting on their flowers! We had an electric fence around the yard last year, but ended up taking it down as it had been breached and broken, one too many times. So our yard has become a popular spot for the javelina to hang out! We have to get photos quick, before they come through and wreak havoc! 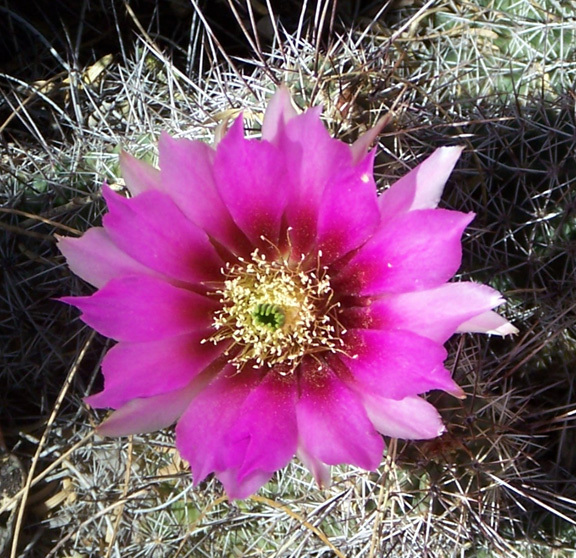 The hedgehog cactus blossoms are the javelina’s favorite! Luckily, we did get a pic of this one before it was gobbled up! 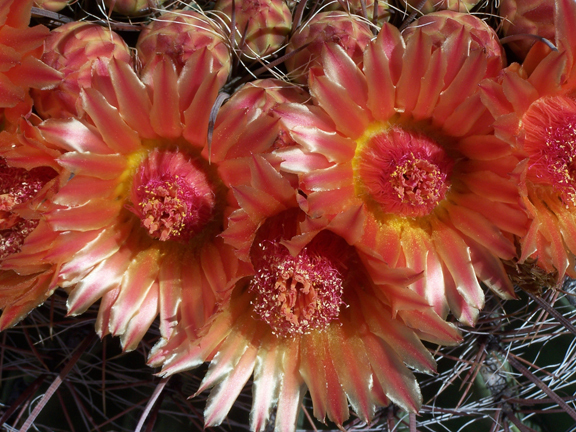 These, and the barrel cactus blossoms, are the most susceptible to javelinacide. 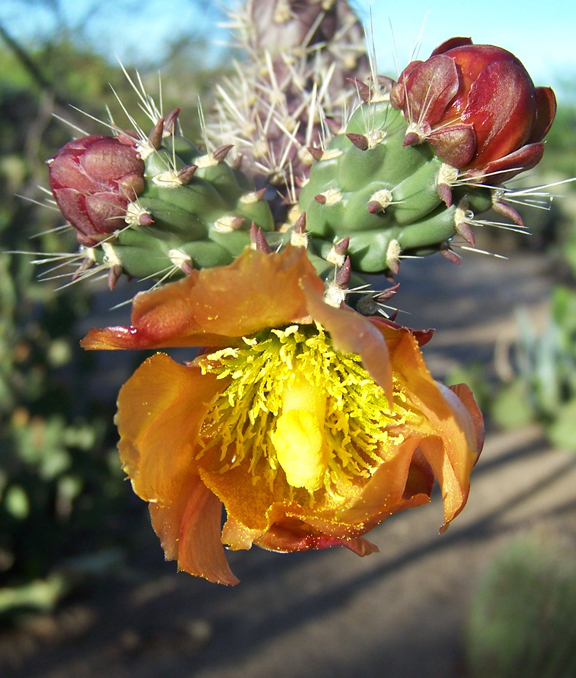 Most of the other cactus blossoms such as prickly pear and cholla are out of their reach. This was the very first blossom we spotted, popping out just last week. 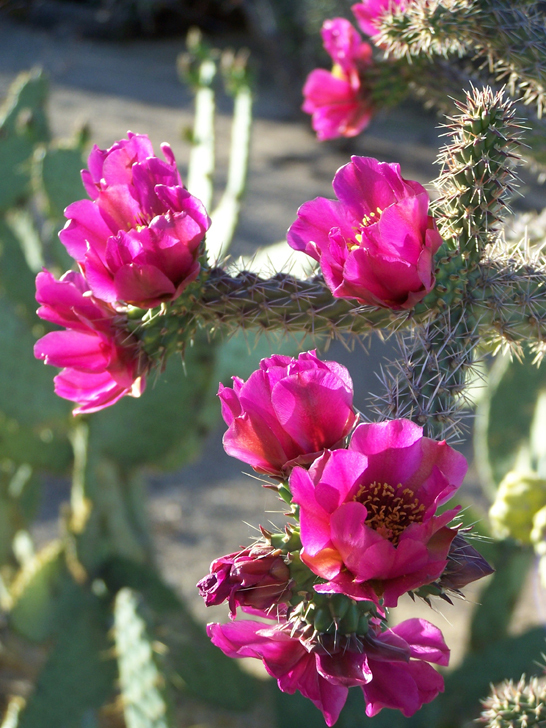 It doesn’t take long for the rest to follow suit, and within the next few weeks, we should be in full cactus blossom mode! 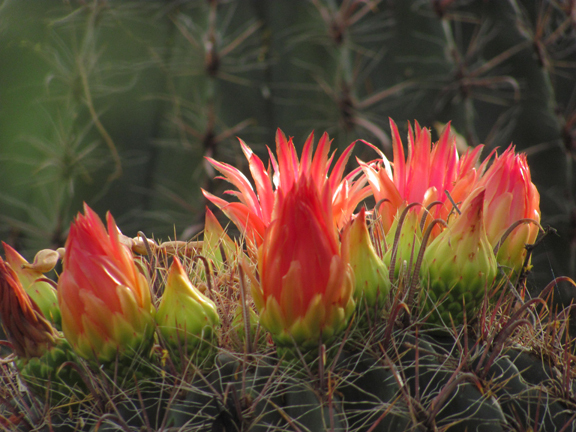 The cacti are not the only desert foliage bursting with brilliance! 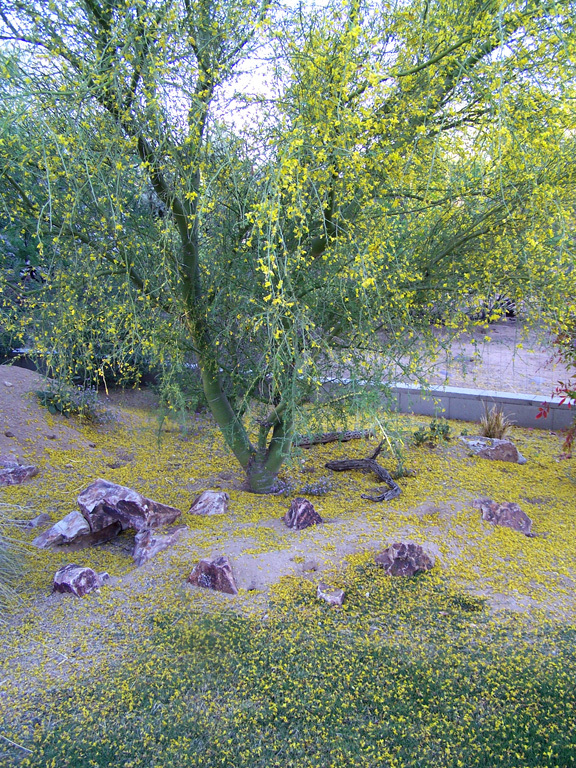 The Palo Verde trees not only look fabulous….they smell fabulous! Not so great for anyone with allergies, after about two weeks, we have a nice dusting of yellow ‘snow’! The mesquite and acacia trees are also nice and fluffy right now! Talk about allergy misery!…. 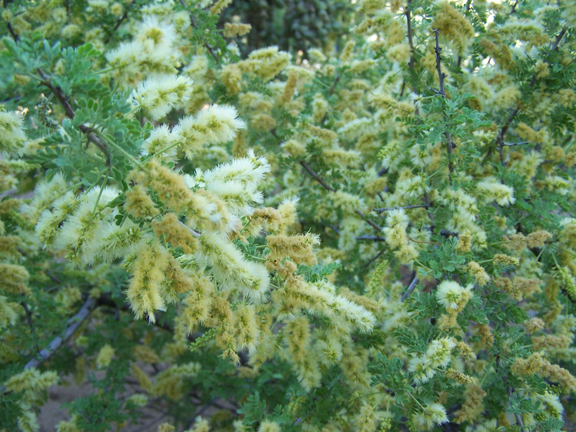 If you’ve never smelled a blossoming acacia tree, there is no other smell quite like it. The only way I can describe it is it’s like a super sweet piney scent. Wish someone could bottle it! Needless to say, Todd’s Backyard is truly awesome in the Spring! 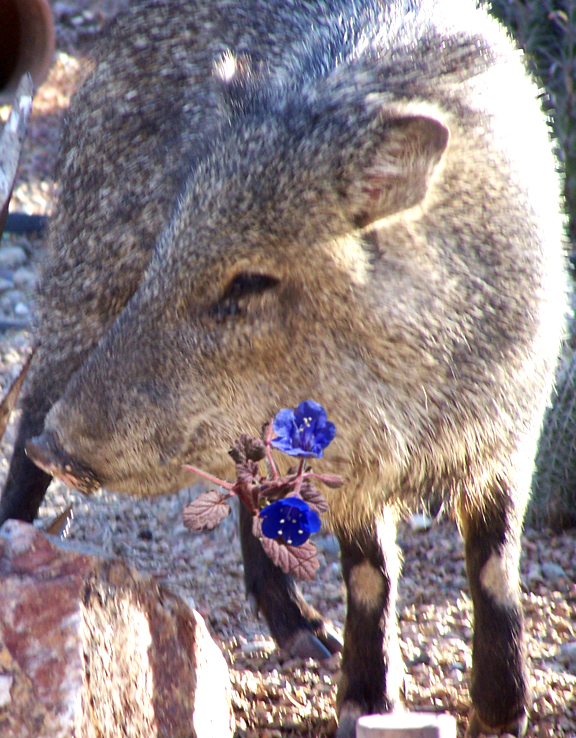 Now….if we could just get the javelina to stop committing blossom-atrocities we could really enjoy it! It’s Barrelly Fall in the Desert! It’s almost Labor Day, which brings with it the promise of fall. 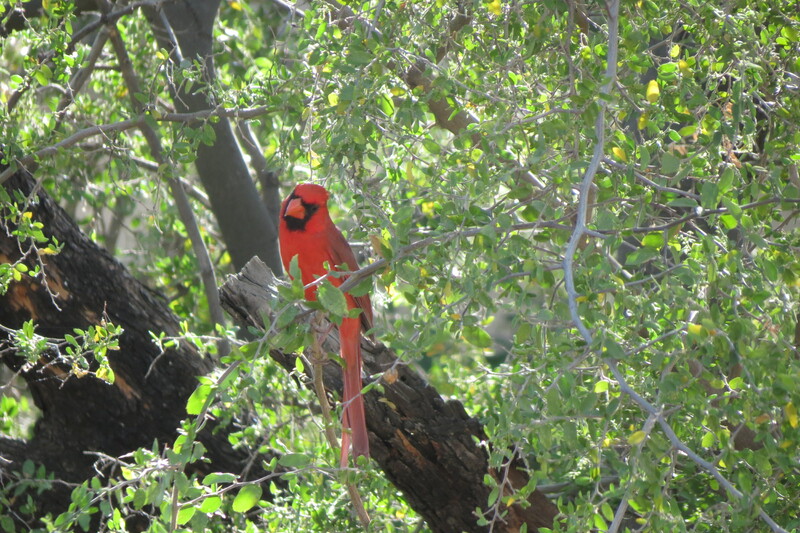 When the rest of the country enjoys autumn with lowering temperatures and colorful trees, we desert dwellers, enjoy it a little differently….The mesquite and palo verde trees stay green and the temps don’t really drop until later, in October. We are, however, treated with a brilliant display of fall color – bursting on the barrels! 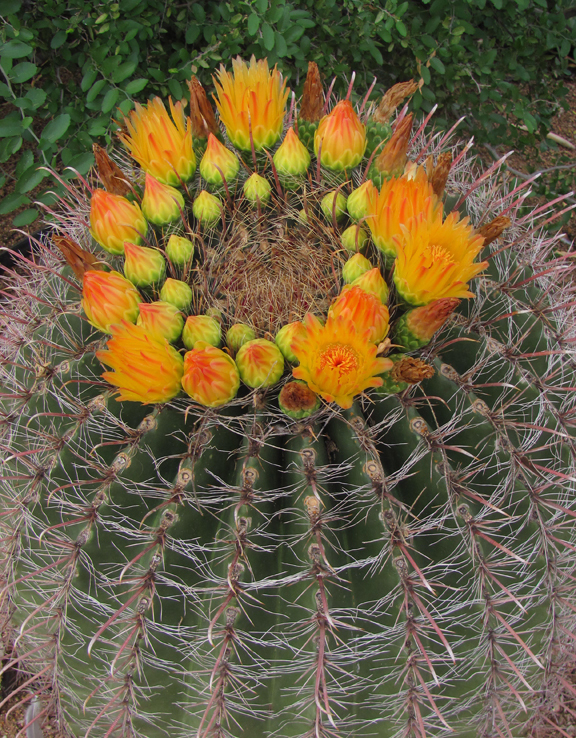 The barrel cactus dot the yard. 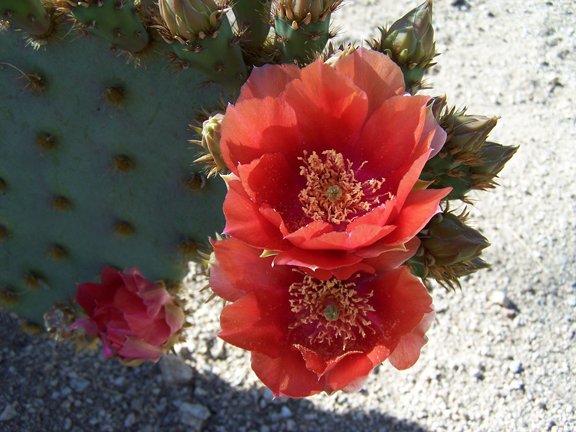 Their flowery crowns in fiery shades of reds, oranges, golds and yellows, infuse the desert with fall color! As they start to blossom, the buds look like flames. 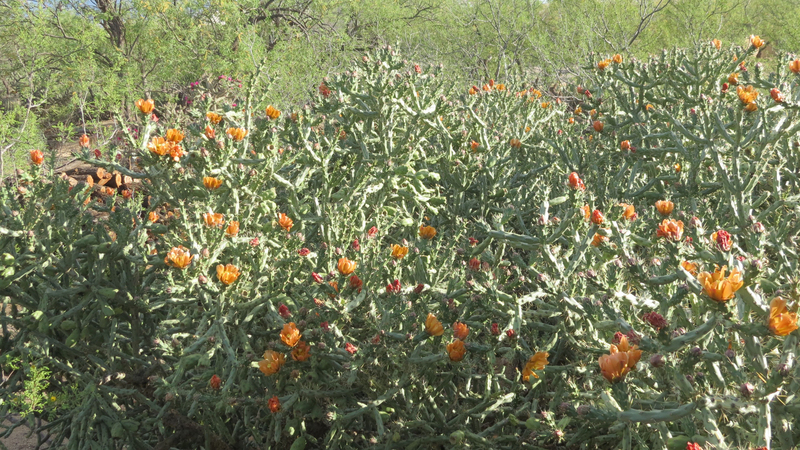 Then, when they are in full bloom, burst into fall fireworks! 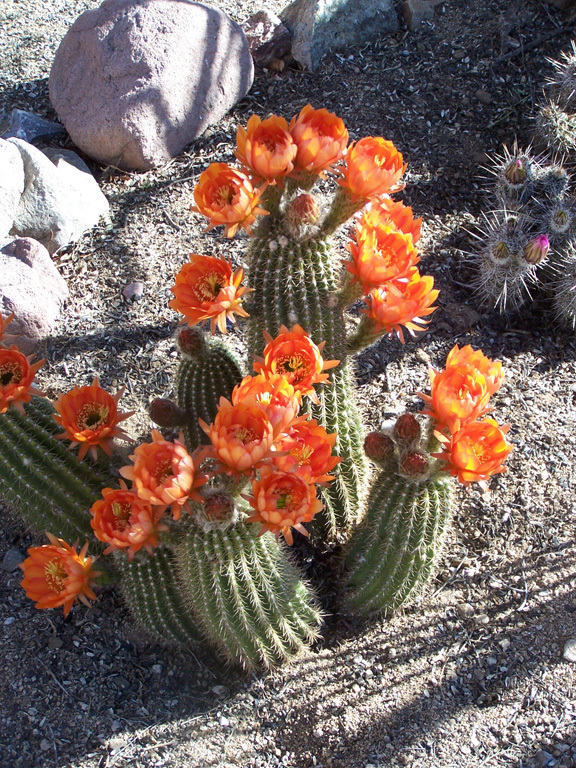 Who says you can’t enjoy the seasons, when you live in the desert!